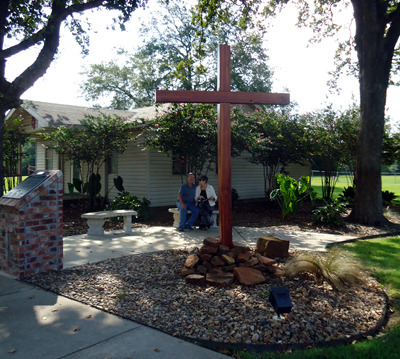 The desire for a permanent place to worship was born in a group of just a few believers who first met in the club house of the Southern Oaks subdivision in early 1995. In 1996 they acquired a tract of land with a small building. 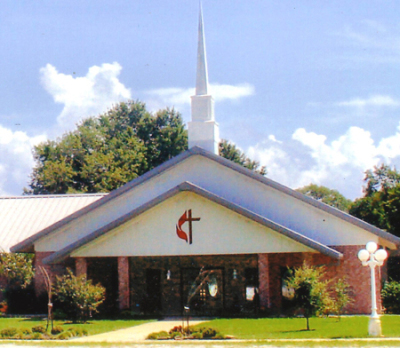 That building became the “Genesis Center,” and the official “church house.” The first service in the Genesis Center was held on March 30, 1997, Easter Sunday. 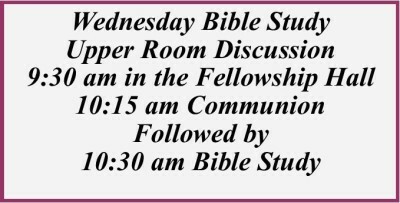 The group that made the church a reality were Bill Carlisle, Dorothy and Don Collins, Lou and Bill McAnulty, Melinda and Robert Moore, Mary Helen and Gene Neal, Beverly and Clarence Robinson, Barbara and Phil Sanders and Donna and Gene Strause. The present sanctuary was completed and dedicated in 2000, followed by completion of the kitchen and fellowship areas in 2002. Offices and a nursery were added in 2003. The garden area, special flower beds and decorative bridge were added in 2005. Then, in 2014, a prayer garden was added to the landscape. Plans are now in the works for further ex​pansion of the fellowship hall, enabling addition of a pastor's office, choir rehearsal and storage room, as well as a larger fellowship hall. Completion of this addition is expected in 2018-19. From that forward-thinking group of believers who first met back in 1995, the Lakeside congregation has steadily grown, with a current membership of approximately 100 believers, from both the north and south sides of Richland-Chambers Lake.